UPDATE: Enjoy this cute project for one of our Christmas trees in our former home. We’ve moved and are giving our new-to-us home a complete remodel. I’ve completely changed my style! Click HERE to take a look. Today, I’m happy to be participating in the All Things Home Christmas Craft Showcase with 14 other bloggers. We had so much with the All Things Home Christmas Home Tours, that we wanted to keep the party going! 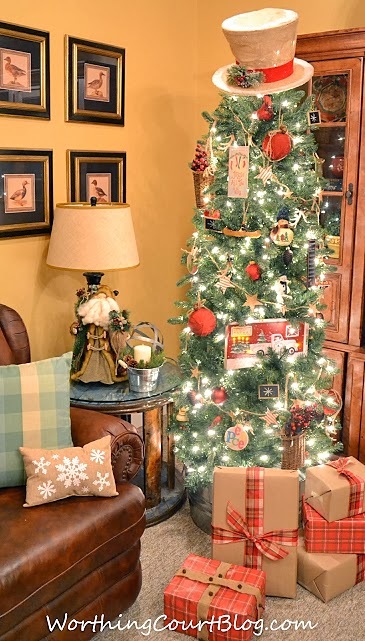 When I put together the Christmas tree in my basement, I decided that I needed a garland to along with all of the other rustic decor on my tree. I knew that I wanted to do something in burlap and then while shopping in Joann Fabrics on day, an idea popped into my head. It’s a little hard to see in this photo with the tree lights on, but can you see the garland? If you’d like to make one for yourself, rest assured it was super easy. Following the directions on the fusible web package, fuse together two layers of fabric. I used burlap on one side and red ticking on the other. Using the stencil, trace the outline of three different sizes of the stars onto the fused together fabric. Cut the stars out. Cut your desired length of twine. My tree is in a bit of a corner, so instead of wrapping my garland all the way around the tree, I chose to make several 6′ lengths. Attach the stars to the twine with a spot of hot glue on the back of the star. I alternated the sizes of the stars and the burlap side and the red ticking side as I attached them to the twine. I love the garland and think it adds just the right finishing touch to the tree! Go visit all the other ladies for more Christmas craft inspiration! I love this garland! A garland is one item that I’ve never used on my tree. Next year I need to make what I want to use in the summer when I have time. Thanks so much for sharing how you made your garland. What a beautiful tree. Love your garland! Your top hat is so cute and I love that your gift wrap coordinates. Suzy, I love the garland. Stars look great on a Christmas tree. 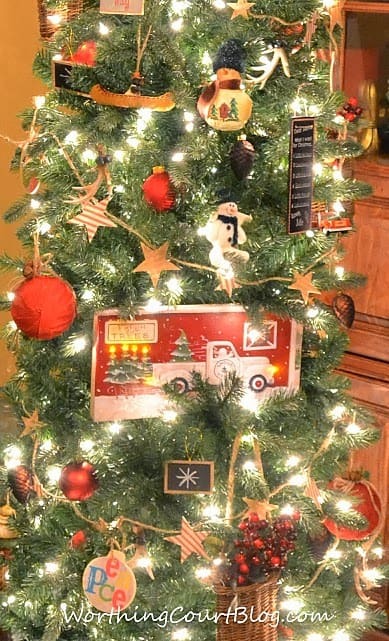 LOve how you decorated the tree with signs and the hat is over-the-top (pun intended!). Have a great week! I love your star garland Suzy! 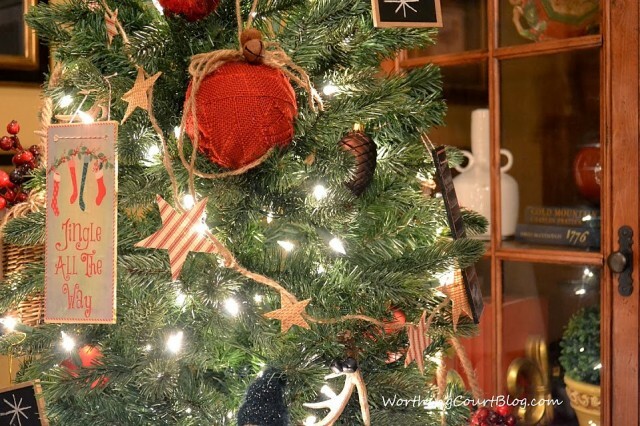 Your entire rustic tree is so beautiful, and the garland you made is the icing on the cake! Definitely pinning this! Thanks so much for the inspiration! Suzy, thanks for this tutorial. I need some ideas to decorate my real tree with. We chop ours down and since the kids have all gone… so has all of their Christmas ornaments. What a darling way to fill up a tree! Thanks! I love your garland. It’s so cute and perfect for your tree! It’s been a pleasure to be a part of this Craft Showcase with you. Have a great week and a Merry Christmas! How cute is that?! I haven’t used fusible webbing in years- it’s a great idea for banners. Love the combo of ticking and burlap. And I looove your skinny tree. I want to get one this year, hopefully in after Christmas sales. Looks great! I’ll be pinning and sharing! I am loving this tree. Your garland is darling, and it is a perfect match. I hope you will come visit my Holiday Home Tour on my blog. Day three is posted. Loving your tree. Your basement has turned out wonderfully. Love it Suzy…beautiful job as always! 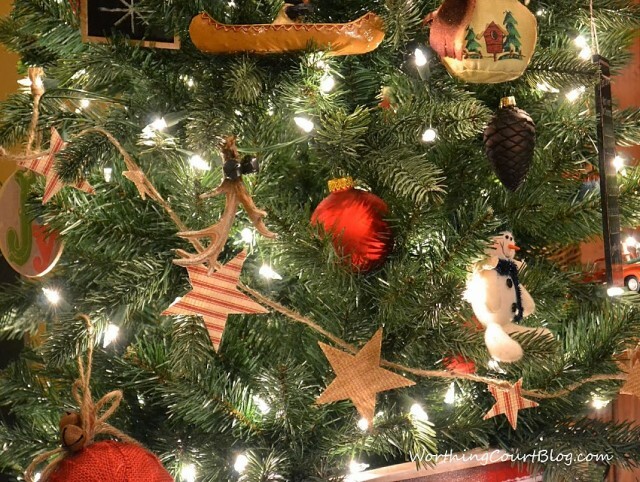 I love your garland and it IS the perfect finishing touch to your tree! 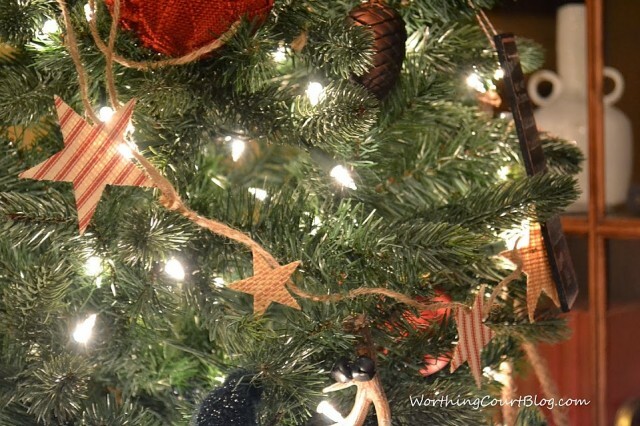 Beautiful garland– I love burlap too!